If you are even a bit aware about the ongoing trends in the skin care world, you just cannot miss all the buzz around glycolic acid. Even till a few years back this was not such a highlighted component in our skin care items, but recently it seems that the most high-end brands of the world have started to make this acid a primary and emphasized ingredient in their skin care product range. In this article we will inform you about the Best Glycolic Acid Products but before that we will take a dig at this new component in the skin care arena. Glycolic acid is one of the Alpha Hydroxy Acids (AHA’s) commonly derived from cane sugar or other organic sources. The other members of AHA’s include citric and lactic acids along with some more. However, amongst all the AHA’s, glycolic acid is considered to be most effective in skin care and treatment particularly because of its molecular structure. Glycolic acid molecules are smallest amongst the AHA’s and hence it penetrates easily deep into the skin giving the most effective benefits. Glycolic acid has long been used by dermatologists to treat different skin conditions. It is a naturally occurring ingredient and can deliver a range of skin benefits when applied in the right way. Recently, researches have come up with glycolic acid formulations that are safe to be used in over the counter skin care products as well. So, the ingredient that was only available previously at the clinic of your skin specialist is now available in your nearby shop. Now let us take a look at what glycolic acid can do for your skin. One of the most important actions of glycolic acid comes from its ability to remove the dead skin cells from the skin surface. It promotes skin exfoliation without any mechanical scrubbing of the skin. The acid naturally dissolves the dead skin cells on the skin surface and reveals the fresh and brighter skin cells underneath. Dark spots, blemishes and scars can actually steal your beauty but with the power of glycolic acid in your hands, now you can easily say bye to any type of blemish and dark spots on your skin. Through its ability to remove the upper layer of skin cells, glycolic acid helps in reducing any dark spots and marks over time. Getting rid of the blackheads and whiteheads used to be a challenge for people without opting for a parlor treatment. Currently, one can just use a glycolic acid based facial cleanser or exfoliator to get rid of black or whiteheads. Glycolic acid dissolves the pore clogging substances that give rise to blackheads or whiteheads and hence by using a glycolic acid based product in your regular skin cleansing routine, you can easily get rid of the problem for ever. One of the most effective usages of glycolic acid comes from its ability to treat acne. Glycolic acid at one hand removes all the debris from the skin that can clog the pores giving rise to acne and on the other it gently exfoliates the skin revealing healthy cells underneath. Glycolic acid also has mild anti-bacterial properties that help in keeping acne causing bacteria at bay. Skin aging is one of the primary concerns for everyone nowadays and glycolic acid can work miraculously to heal the signs of aging. It increases the rate of natural cell turnover, which automatically helps in reducing skin wrinkles and improves ski elasticity. Dull skin and irregular skin pigmentation are some of the other common signs of skin aging; glycolic acid can treat these problems and reveal brighter and even skin tone with regular use. It can also help to minimized enlarged pores on the skin. To tell the fact, it is not all fairy-taleish rather Glycolic acid can actually harm your skin unless it is used in the right way. There are risks involved in using glycolic acid on the skin. However the best products from the top notch brands ensure that their formulations are safe for most of the skin types. So, take a look at the risks involved in using glycolic acid before you include them in your skin care regimen. A high percentage of glycolic acid can cause irritation and redness on the skin. In serious cases it can cause “frosting” that might result into scarring. Glycolic acid makes the skin more sensitive. So, if you already have a sensitive skin make sure that you use it with due caution. Using glycolic acid along with other commonly used active ingredients in skin care products like retinol or Vitamin A can be tricky. This acid makes the skin more sensitive to sun light and hence your skin becomes prone to get sun burn more easily. How to use Glycolic acid products safely? Glycolic acid can actually deliver miraculous results when used in the right way. Here we have mentioned some precautions that you should follow for using any glycolic acid product. It is really important that you use glycolic acid formulations manufactured and marketed by renowned brands. For best results on the skin, you need to use pure glycolic acid in less concentration. Most of the high end skin care products with glycolic acid are formulated with not more than 2% of it. The maximum permissible percentage of glycolic acid in over the counter cosmetic products is 10% and it is used in this high concentration only in glycolic acid peels. 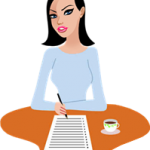 After you have bought a glycolic acid based product, the first and foremost thing you need to do is to check out the instructions and precautions mentioned on the packaging of the product. If you still have doubts about the usage instructions even after going through the labels, check out the website of the company to be sure about how to use the product safely. Different products with glycolic acid are formulated for serving different needs and it is important that you use it for the only purpose for which it has been formulated. Once you have started using a glycolic acid product on your skin for the first time, it is important that you keep a close check on your skin. If you are using a product from a good brand in the right way you really have nothing to worry about but still it is only wise to keep a close check at how your skin is taking the new treatment. If you observe any sign of redness or skin irritation, flaking that seems not to soothe even after a few hours of application, you might need to talk with a beautician or the SA who suggested you the product. When you are using a glycolic acid based skin care product like moisturizers, serums or peel, particularly with higher percentage of the acid, it is important that you pick any other product to be used on your skin cautiously. Many other active ingredients commonly used in skin care products might not go well with glycolic acid formulations. Using retinol or Vitamin A enriched products along with glycolic acid based products can also be tricky. So, make sure that you use products that are suitable for use along with the glycolic acid based product. Glycolic acid is sure to make your skin more sensitive towards heat and harmful rays of the sun. So, as soon as you start using a glycolic acid based product on your skin regularly, ensure the best protection for your skin. Avoid going out into the sun and always lather on a good amount of sunscreen every time you step out. Also avoid being close to heat. However, these side effects become more prominent only when you are using a serum, moisturizer, peel or lotion with high percentage of the acid. Using a face wash with minimal percentage of glycolic acid might not actually make your skin that sensitive. 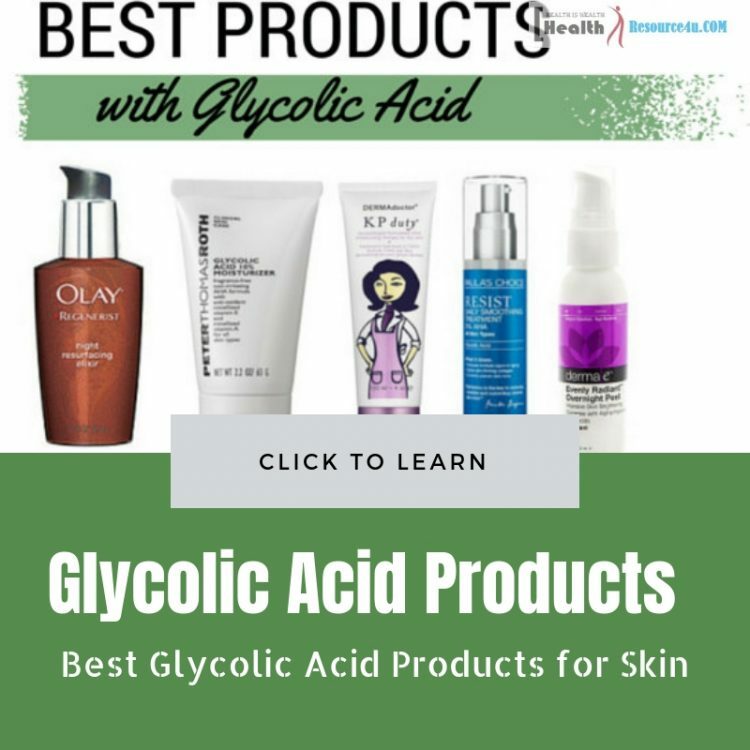 Having elaborated on some of the most important points that you should know about glycolic acid and glycolic acid enriched products, we will now move on to the main topic of this article, the Best Glycolic Acid Products in the market. When it comes to the Best Glycolic Acid Products, we could not help but to enlist one of the top most anti-aging products infused with Glycolic acid at the top, because, this skin rejuvenating treatment can eliminate more or less every skin problem with regular use. For the first time you are being presented with a combined and concentrated formula that can dramatically improve your skin reducing the signs of aging, irrespective of your age. The formula can heal all the major signs of skin aging, including, wrinkles, enlarged pores, dull skin tone and lack of skin elasticity. The composition of this product is proven to improve the regeneration rate of the skin cells that helps the skin to rebuild its collagen level. No matter how serious the signs of aging are on your skin, you will wake up to a dewy and fresh complexion after using this night cream just for 3 nights at a stretch. The Ultimate Miracle Worker Night Serum in Cream from Philosophy has a composition list that contains a number of ingredients known for working miraculously on skin for removing signs of aging. While most of the ingredient list is populated with organic as well as inorganic chemicals, amongst the natural ingredients, it contains sunflower seed oil, apricot kernel oil and root extracts of the Iris pallida plant. It also contains glycolic acid as well as retinol. The product uses patented technologies and ingredients that promotes epidermal repair. 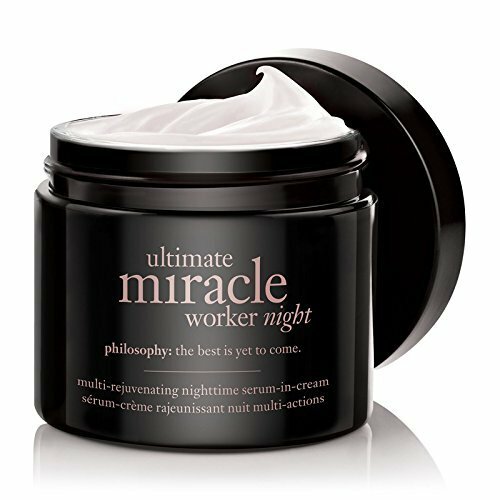 Philosophy Ultimate Miracle Worker Night serum in cream comes in two parts. The cream in a black jar and pink pearl bids in serum, sealed in a transparent container. Before you start using it, you have to mix the pearls in serum with the cream in the jar, mix the two well with the spatula and wait until all the pearls are dissolved completely in the cream. It will not take more than 5 minutes to dissolve. The concept of giving the final touch to your cream in serum, by your own hands is really fancy. Once the pearls have dissolved, you can use it on a clean and dry face every evening. According to the users, if your skin is suffering from serious signs of aging, this product can be an one stop solution. The best thing about this formula is that, it works even on the most deep set wrinkles and lines. It improves overall skin hydration and gives the skin a rejuvenated look within a week of use. This product works really well on dry skin and makes it not only super hydrated, but soft and smooth. Irrespective of your age, you can rely on this product to give your skin a lift and improved texture. It has a smell that is enchanting and it is absorbed quickly into the skin upon application. It does not cause break out and is not at all heavy on the skin. The ability of the formula to work as a serum as well as cream makes it a preferred choice of the users. This Cream in Serum contains Glycolic acid which is known for delivering a number of skin benefits. It also has retinol, one of the most effective ingredients to remove signs of skin aging. The product has an enchanting scent. It works as both serum and cream. The formulation gets absorbed easily into the skin and feels light. It hydrates skin really well. This cream in serum can improve wrinkles and skin elasticity even in aged people. It contains both glycolic acid and retinol and according to some, glycolic acid inactivates retinol, hence you hardly get any benefit of the retinol in this formulation. This product might not be suitable for young skins with mild wrinkles or slight signs of premature aging. The price tag is really hefty. For matured and aged skin Philosophy Ultimate Miracle Worker Night serum in cream is one of the best anti-aging products available in the market. If you are aged over 50 and nothing seems to really make your skin happy and look fresh, try out this formulation and you might not need to look out for another formula again. If your skin is suffering from signs of aging, hyperpigmentation, acne or redness the Jan Marini Skin Research Bioglycolic Face Cleanser is formulated just for you. This soap free gentle cleanser not only removes trace of dirt and excess oil from the skin but also exfoliates it gently, improving the cell turnover rate. The formula is suitable for all the skin types. It gives deep cleansing without irritating the skin in any way. The product leaves the skin soft and hydrated. You will not need to use a toner or astringent after cleansing your face with this wash. It contains glycolic acid in its most active form to deliver the best results in cleansing and rejuvenating the skin. Apart from glycolic acid the formula also includes sorbitol and natural humectants which help in keeping the skin soft and hydrated after every wash. This cleanser should be used twice in a day, once in the morning and once in the evening for the best results. One needs to massage a small amount of the cleanser on dry skin gently for few minutes and then remove it with a damp washcloth. Once removed, wash the face with lukewarm water and pat dry. It should not be used as an eye-makeup remover as it can sting eyes seriously. This cleanser has a great fan base. According to reviews, anyone who have used this formula to fight with their skin issues, have benefitted from it. This cleanser can be ideally used on any skin type of any age. It seriously helps in controlling acne and breakouts of younger skin and at the same time it works miraculously in cleansing aged dry skin, adding a dose of hydration. The formula is soap free and cream based and yet it suits the oily skin well due to its innovative and active composition. It makes the skin clearer after every wash and can even work on the primary signs of aging like fine lines and increased pore size. The cleanser suits every skin type, dry, normal, oily as well as sensitive skin. Works effectively on the signs of skin aging. Makes the skin softer and brighter after every use. Is ideal for use in every age. Eliminates the need of using a post cleansing toner or astringent. There is no user for whom the Jan Marini Skin Research Bioglycolic Face Cleanser has not worked. Except the price there are actually no other cons for this product. We suggest you to use this cleanser if you are suffering from any skin problem like mentioned above and you do not mind using well-formulated and safe to use chemicals on your skin. Problem free young skin does not really need this high end cleansing treatment. 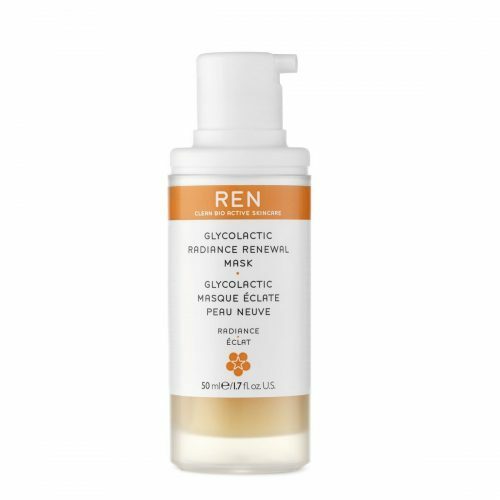 REN Glycol Lactic Radiance Renewal Mask is known as an instant treatment for skin fairness. If your skin looks tired but you need to attend a party without the scope of taking a nap in between, this mask is what you need. The product is pricy and is considered as one of the Best Glycolic Acid Products due to its effectiveness. Perfect your complexion instantly with this Glycolic Lactic acid renewal mask. It brightens the skin tone and perfects the skin texture right from first use. The active formulation also helps in minimizing skin pores, eliminating irregular hyperpigmentation as well as fine lines. In a sentence, this mask will renew your skin and fight all the signs of skin aging for you, giving you brighter, fairer and fresh looking skin. It dramatically reduces sun damage on the skin and can erase sun tan as well as old acne scars magically. REN Glycol Lactic Radiance Renewal Mask contains a mixture of four acids, glycolic, lactic, citric and tartaric. The best thing about this formula is that, all these acids are extracted from their true organic sources, like pineapple, lemon, grape and passion fruit. It is formulated without Parabens, sulfates, glycols, silicones or PEGs. To put simply, this is one of the most natural and organic formulations of AHAs available in the market. It also contains organic components like papain, Mandarin orange peel, Tangerine peel oil, grapefruit seed oil and Vitamin E.
Using the REN Glycol Lactic Radiance Renewal Mask is as easy as anything. Only make sure that you apply it on a clean and dry skin. Lather the formulation on your face in an even layer. Do not apply it near the eye area. Let it set for 10 minutes and the rinse off with excess lukewarm water. Pat your face dry. We really like it when we get products that have only good reviews from the users. According to users, this product is one of the best glycolic acid masks available in the market. It actually works and delivers as per claims. The application is easy but you might not like the smell of the product. It gives a glow to the skin after use and the glow continues to stay for as long as a week. You need not to use the mask frequently, once in two weeks is sufficient to keep your skin fresh and problem free always. So, if you are looking for an active glycolic acid mask that needs minimum time and effort for use, this one can make a good pick. It contains a bunch of natural acids as well as enzyme like papain. The formula addresses more or less all the types of aging related skin problems at one go. It gives instant brightness and fairness to the skin. Works even on old acne marks and scars with efficiency. Frequent use is not needed for getting the best results. Suitable only for matured skin. People with sensitive skin should stay away from this product. If you are aged over 40 and your skin has started to show the signs of aging, the REN Glycol Lactic Radiance Renewal Mask can be an effective treatment to get back your younger skin within a month or two. It works well and gives results quickly. However, it is a harsh formulation and not suitable for young or sensitive skin. So, spend on it only if your skin is fighting with prominent signs of aging and you do not have a sensitive skin. This toner not only tones the skin effectively improving its natural elasticity but also exfoliates and purifies the skin from deep within through its glycolic acid based formulation. The active natural ingredients present in this toner, improves blood circulation in the skin which naturally helps in better cell turnover. The toner is hydrating; it works gently on the skin without any irritation. It also helps in minimizing the appearance of pores while healing and balancing the natural pH of the skin. So, if you are looking for an alcohol free toner that can take care of most of your skin problems at one go, try out this formulation. Pixi Glow Tonic with Aloe Vera & Ginseng contains 5% glycolic acid along with extracts of ginseng and Aloe Vera. While Ginseng works to improve skin quality as a whole, Aloe Vera hydrates and nourishes the skin. The other mention-worthy plant based ingredients present in this formula include, Horse chestnut seed extract and hydrogenated castor oil. It also contains Biotin in its purest form. It is formulated without alcohol. You can use this toner in the morning or in the evening or as per your needs. Before you apply this toner, cleanse your face properly. Soak a cotton pad in the toner and sweep across your face. Do not apply to the under eye area of the skin and do not rub the toner in. Simply apply and leave on till it gets dry. You should follow with a serum or moisturizer after using the toner. Pixi Glow Tonic with Aloe Vera & Ginseng is an expensive toner but it works and delivers more or less all the claims that it makes. Regular use of this toner can improve the complexion, elasticity as well as overall hydration of the skin. If you are suffering from enlarged pores on your skin or scars that needs quick healing, this toner can work effectively for you. However, it does not start showing results right after application or even in the first month. You have to continue using the product religiously to get the results. The toner is colorless and has a light fragrance that is not overpowering. It is quite helpful in clearing out the breakouts too. It is an exfoliating toner, so serves a two-in-one purpose. The product is mild on the skin though it has 5% glycolic acid. Free from alcohol and suitable for sensitive skin as well. Do not cause dryness after application. Promotes smooth skin and brightness. A nice healer for breakouts and pimples. It contains 5% glycolic acid and hence is not suggested for regular use on young skin. Once you stop using the product, your skin will go back to how it was before. Pixi Glow Tonic with Aloe Vera & Ginseng is an efficient alcohol free toner that actually works. It is expensive, but will give you results that are worth the price. However, if you are looking for quick results, this should not be your first choice. It is a good product but we do not suggest spending on it unless you already have some skin problems that it can treat. The claims of this glycolic acid peel are pretty simple. It does everything what a 50% glycolic acid peel should do. It removes the upper layers of the skin, revealing the fresh lower skin cells. The peel improves cell turnover rate, which naturally solves most of the skin problems related to aging. If you are fighting with wrinkles, uneven pigmentation, dull skin or serious acne spots, this peel can give you effective results. This straight cut glycolic acid peel contains 50% glycolic acid in water. Apart from these there are a few glycol compositions and Potassium sorbate in the peel. It also contains Sodium Hydroxide for neutralizing the acidic effect of Glycolic acid to some extent. This is a professional quality chemical peel and should be used exactly as directed. If used in a wrong way, it can harm the skin seriously. It is suggested to use this peel every 2-3 weeks for the first two months and then using it once a month is sufficient. Before applying the peel, clean and pat dry your skin properly. Apply it evenly to your skin in a thin layer. Do not apply it close to the lips or eyes. Initially you should not keep the peel for more than 1 to 2 minutes on your face. You can stretch the time maximum to 5 minutes only after you have used it for over 2 months and your skin has properly adjusted with this formula. Wash it off with a neutralizing solution made with baking soda and water. Pat dry and follow with a good moisturizer immediately. Well, OZNaturals Glycolic Acid Facial Peel has been garnered with excellent, good as well as bad reviews. However, none have ever noted that this peel does not work. It works, it actually works and hence if you are not using it the right way, it might harm your skin. This product removes the upper layers of the skin efficiently revealing fresh skin cells. It can work as an effective treatment for fighting with all the age related skin issues like fine lines, wrinkles, uneven skin tone, scars and pigmentation. A formulation that gives you the result of the best anti-aging parlor treatments at home. It removes upper layers of skin with a single use. It reveals glowing and fresh skin in a single use. If you are looking for instant results, it can be a great product for you. It is formulated without fillers and added chemicals. Helps in clearing out blocked pores and blackheads. The product is suitable only for matured skin suffering with aging related issues. It needs to be used with precautions otherwise it can make the skin flaky and dry. Retinol products cannot be used before or after 48 hours of using this peel. 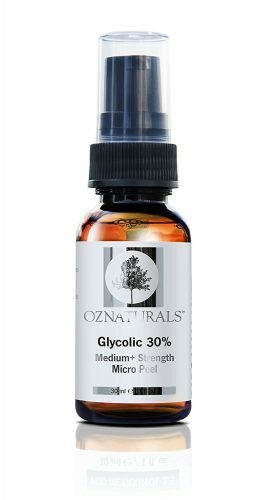 OZNaturals Glycolic Acid Facial Peel works according to its claims. It does exactly what a 50% glycolic acid peel should do on the skin. If you are aged over 40 and your skin is suffering from aging related problems, you can surely try out this one while maintaining all the precautions mentioned in its label. The formulation is not pricy but when used in the right way it can help you to replace the expensive parlor treatments. Use a glycolic acid product only if your skin needs it. If you have a problem free skin, just do not start using a glycolic acid product to make your skin better. People who are aged below 30 should not use glycolic acid based products that stays long on the skin, like a moisturizer or serum. 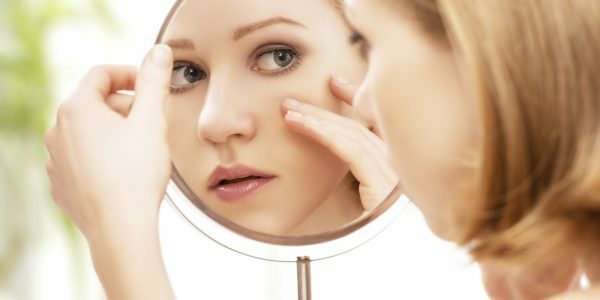 However, using a glycolic acid based face wash or acne spot treatment from a reputed brand might be safe. Always buy glycolic acid products only after doing your research on it and ensuring that your skin actually needs it. Glycolic acid products essentially come with other ingredients in the formulation as well. So, do not miss to take a look at these ingredients too before making the purchase.